We are committed to an Open Church policy throughout the week, as a means of witnessing to the Christian life in the city centre. In this, we aim to make full use of our resources of buildings and people, and our Open Doors development project seeks to enhance this witness. The church sanctuary is open for at least part of each weekday, to all who may wish to come in, for sight-seeing, quiet or prayer. It is staffed by volunteers. Every Wednesday lunchtime at 12.30 a short prayer service is held in the church. This is an opportunity for those visiting and working in the city centre to spend a few minutes in quiet prayer and meditation. Every Wednesday morning, we serve coffee and tea to the public from 10.00 to 12.00. This is a very popular venue for shoppers, and for friends to meet each other. Come and experience the refurbished premises! Rainbow House for under-fives is open on Wednesdays, Thursdays and Fridays from 10.30 to 2.00 pm, during school term-time in the newly refurbished large hall. This drop-in centre for accompanied pre-school children offers inexpensive snacks and lunches, children's portions, space to play, toys, books, climbing frame and baby feeding and changing facilities. For more information contact the Co-ordinator during opening times, or via the church office. New customers and volunteer helpers always most welcome. NB We often close for holidays ON the last day of term. Check our FaceBook page. Oxford Phab is a social club for people of all abilities, who come together to enjoy each other's company and participate in a range of activities. New members, disabled and non-disabled, are always welcome. Club meetings are on Friday evenings. The church premises also provide a base for voluntary organisations including Cruse, a national charity which offers help to those who have been bereaved. With our city centre colleagues of St Michael at the Northgate Church, St Columba's URC, and New Road Baptists, we seek to address matters of social, political and ecological concern in meetings and workshops. Wesley Memorial is involved in the good work of the Street Pastors. Oxford Street Pastors operate on a Friday night in the city centre and work with those who are vulnerable and require practical help or a listening ear. The Street Pastors are volunteers from local churches who have undergone training in topics such as drug and alcohol awareness, youth culture, mental health issues, conflict resolution and listening skills. They undergo checks (references and DBS checks) before they are trained. The minimum age for a street pastor is 18 years old; in Oxford there is a mix of people of all ages and backgrounds serving as street pastors including students, city councillors, ministers, doctors and academics. The oldest street pastor is 80 years old. They work alongside the police in helping to prevent crime, by diffusing situations that could become violent or helping to calm situations if they have already become violent. 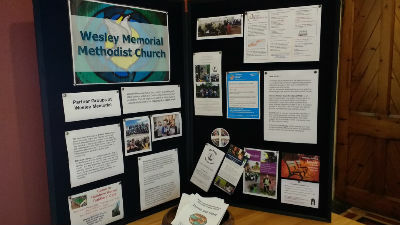 In partnership which many Oxford churches, Wesley Memorial opened its doors every Sunday night from January to March, to welcome up to 10 homeless people. Other churches took the rest of the week and so the facility was run from January 2nd to March 31st 2018. A wonderful ecumenical success which we are repeating in 2019, with double the provision in 2 venues each night!